The Fresh Music Page: Morning Cup of Soul: Candice Glover & Jennifer Hudson - Inseparable - The Duet Almost Killed Me! Morning Cup of Soul: Candice Glover & Jennifer Hudson - Inseparable - The Duet Almost Killed Me! Last night was quite a night in American Idol TV and now history. Candice Glover won American Idol just like I knew she was destine to do. The most amazing part was before she was announced the winner, former American Idol contestant, Grammy, and Oscar winning singer/actress Jennifer Hudson sung a duet with her. This duet put me on a natural high and I could not come down. It had me in my man cave screaming to the top of my lungs because as Tamar Braxton would say "They did THAT!". 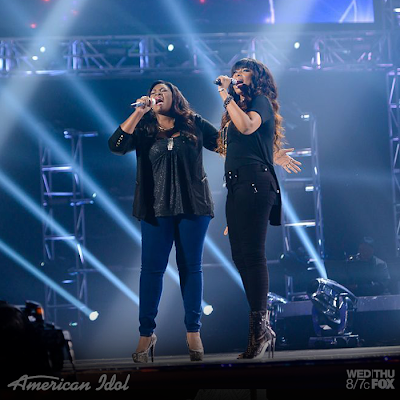 Candice Glover and Jennifer Hudson was absolutely amazing. I didn't think anything could top this, until they brought out my favorite singer in the world, one of the greatest voices to ever hold a microphone, The Queen of Soul: Aretha Franklin. That's when I took to my couch and damn near fainted. The only thing that saved me is that she wasn't there in person. Aretha made the top girls her background singers and went to sing a medley of hits. Aretha Franklin is 71 years young and still going strong. Just a blessing.